What is The ‘Drop Off’ System? 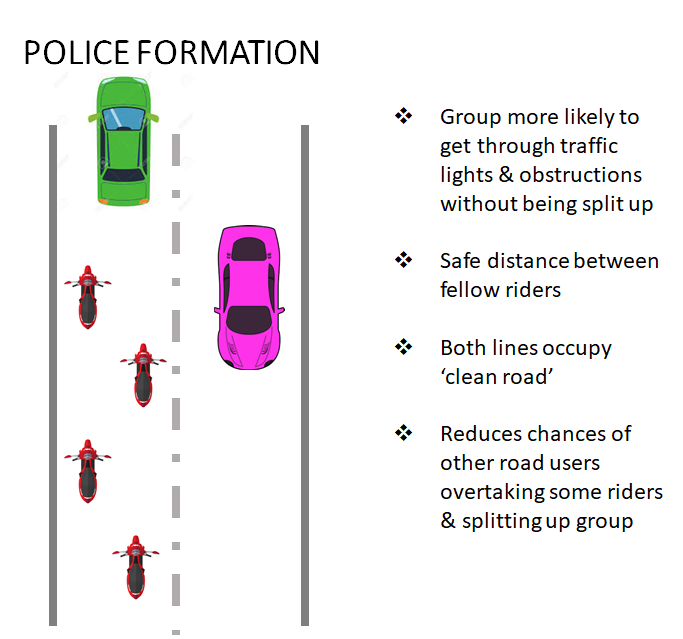 This is basically a system designed to make group riding safer and more enjoyable for all by (hopefully) allowing for the group getting split up without becoming lost and to avoid the dangers of a long line of motorcycles causing dangerous frustration to other drivers. It also permits riders to travel at their own comfortable pace without causing too much frustration for those wishing to ride briskly. Generally there will be a Run Leader and one rider serving as Back Marker. Both the Leader and the Back Marker should wear a reflective vest so that they are easily identifiable as their position in the run will remain static. Both should know the precise route planned! The ride leader will brief the group on the riding formation prior to departure. On the approach to any deviationof route, the Leader will signal to the rider immediately behind him and that rider will then stop in a safe and conspicuous position to indicate the direction the run has taken (in other words he will act as a mobile signpost for the rest of the group) and remain there until the approach of the Back Marker (easily identifiable) and the rejoin the ride immediately in front of the Back Marker. The Back Marker should always leave sufficient space for these riders to re-join in front of him but if for safety reasons that isn’t practical, then the rider should re-join at the rear and pass the back marker when safe to do so. 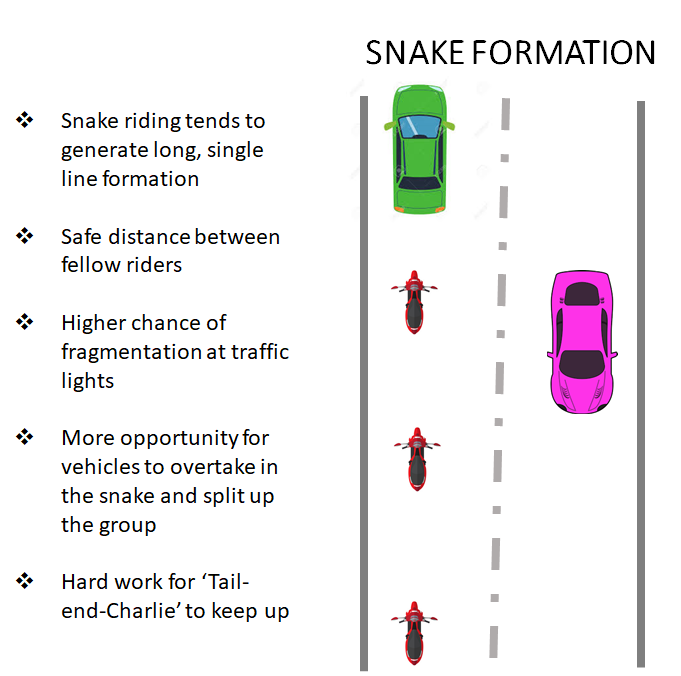 In this manner all riders (except the leader and rear) will constantly change positions within the group and if operated correctly, there should be no danger of riders getting lost because they are riding slower than others. this system also avoids the dangers of the slower rider being forced to ride at speeds they are not comfortable with and thereby putting themselves and others in danger. 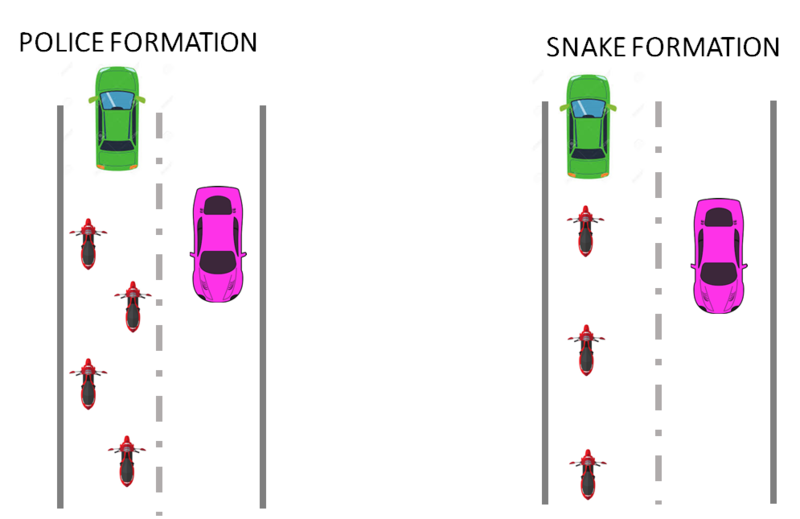 Important note: If you miss a turning or go the wrong way, then you need to make a legal U-turn and re-join the group, as the backmarker rider will be waiting for you.